A brief analysis of and theory about the strange glow of photon torpedoes. 1. Torpedo casings have been seen on several occasions as two meters long, black or grey in color, and demonstrate a distinct lack of glow. 2. Torpedoes, when fired, glow like crazy, whether at warp or impulse. Different Federation torpedoes have glowed in many different colors, from yellow (VOY) to red (Star Trek VI), and from blue (ST:TMP) to white (TOS, and I suppose you could say Quantums, too). 3. There is no logical reason for a torpedo to be made to glow this way. "Tracing" the torpedo is unnecessary, would make it easier to shoot down. One could try to say that it is holding on to its impulse drive products, but why would this be desirable, and how would it work at warp? It's also not the crazy idea I just came up with, that being that the torpedo is constantly firing phasers on widebeam around itself. This would be weird at warp, and though it might help the torpedo penetrate shields, it would only make sense if the torpedo were firing (and therefore glowing) in front of itself. 4. On the new series Enterprise, their older spatial torpedoes do not have a glow. Of course, they don't have shields, either. Given the above, it is clear that something else is going on. It should be readily apparent that photon torpedoes have some sort of high-energy field surrounding them. But what? It's certainly not anything designed for low-observability. Besides, energy output like that ought to make them *easier* to target . . .
We know what a ship looks like when it has shield power driven up to such an extent that the ship is not worried about burning out its own works (the one-way trip Orion pirate vessel in "Journey to Babel"[TOS]) . . . it glows like a torpedo. 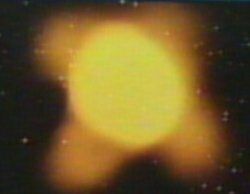 Further, we know that photon torpedoes can comfortably enter a star ("Half a Life"[TNG]), or smack into a planet and dig before detonating ("Pen Pals"[TNG]). It is also the only logical explanation for how a solid object can be set to the right frequency to bypass starship shields, as seen in Generations. Of the possibilities, shields would seem to win out. 1. The concept of shielding is confirmed in "Half a Life"[TNG4], though I didn't recall this when I was first making the page. Dr. Timicin has spent the last few years of his life developing a guidance program for Federation photon torpedoes, so that they can be used to restore the star of Kaelon II. No mention is made of further modifications to the photon torpedoes, and the torpedoes look no different than usual. 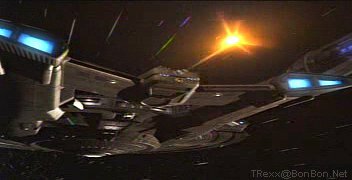 The photon torpedoes that are fired are capable of reaching the star's core, and Timicin reports that "their shields are holding". The torpedoes then sit there for over six seconds waiting to detonate. Why is this subject so amusing to me? It was one of the first concepts I fielded on ASVS, and I can still recall the efforts of some to disprove it with nothing more than flame and ridicule. 2. 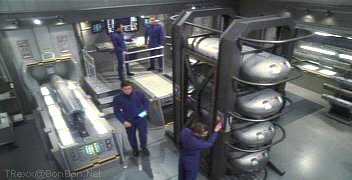 The new series Enterprise has begun showing "photonic torpedo" use by the Earth Starfleet of the 2150's. Naturally, these torpedoes give every appearance of being virtually identical to their later incarnations. Reed: "Starfleet's been working on creating a stable EM barrier for the last five years." Reed: "Right. They just haven't found a way to control the particle density. All the specs are in the database. I've been trying to jury-rig a prototype of my own." Reed: "I've got it stable enough to absorb a phase pistol blast 60% of the time. I think I can improve on that." It would seem that he, or someone back on Earth, did indeed improve on that. Of course, shielding an entire starship is a much larger affair, but this should mean that Starfleet will have ship shields in the not-too-distant future. Given the rate of technological advancement on Enterprise thus far, that means another season or two (and holodecks the season after that, with replicators appearing shortly thereafter (sigh)). We'll see what happens. The second event falls right in line with our expectations. The casket would not be shielded, and thus ought not glow. The first event, however, does not meet with those expectations. The only difference between the two events would be the proximity of (and apparent aiming for) a planet. In Star Trek III, David Marcus remarks that the gravitational fields were in flux, and thus the casket, resting on the surface, must've soft-landed. It would seem, then, that the intent of the burial torpedo was that it would survive atmospheric entry (supported by the aerodynamic profile of the torpedo's shield glow, as seen above), and embed itself some unspecified distance into the surface of the Genesis planet. There is one counter-example I've discovered, thereby making this a sort of self-objection. In Star Trek II, the battle in the Mutara Nebula explicitly causes the Enterprise and Reliant to be unable to raise shields, and yet the torpedoes fired by both ships glowed no differently than usual. I suppose one could argue that the torpedoes had a slightly different shielding system, though that would make little sense. The best explanation to my mind would be that the torpedoes were small enough to maintain shielding in spite of the nebula's effects. It is worth noting, however, that a torpedo fired from the Enterprise while in the nebula shows a very unusual 'sparkly' effect not seen elsewhere in the film, suggesting that perhaps the shields were unstable.